I’m talking about Djehuty, of course. “The Beaky One” is really one of his epithets! In the past, I was never that interested in him. I could never figure out how to pronounce the name “Thoth”. Does it rhyme with “Goth”, is the final ‘h’ silent? ‘Tote”? “Toth”? Then there’s the bird head thing. He’s usually depicted with a little teeny ibis head, or as a baboon. Neither of those really says “smart” to us, does it? As depicted in art, he has to be one of the sillier-looking Gods to modern eyes. When I became Kemetic, I was much more interested in the Goddess Seshat, who is often listed as his consort. She’s the Mistress of Databases, so I feel that I was an unwitting priest for her during my former career. “Oh Seshat, please take me back into your service, when my work was valued and I was well-rewarded.” Sigh. She’s also the Goddess of writing (her name means “female scribe” or “She who writes”) and libraries. Even her aspect of “measurer” connects with me- I liked measuring antique musical instruments and furniture, and drawing up plans to build things. And she wears that leopard-print outfit! Her temple and priestesses- Munu, Wadenet, Zizi, and the rest, have a large role in the Safari novel project. But Djehuty? I was reluctant to jump on a table and declare “I am the Wisdom Guy! !” He does seem to own a quarter-share of my natron (and I made two quarts of it!). So he does get mentioned daily in my shrine. However, as I get more and more interested in Heka, Djehuty gets more and more important. You may remember I did the big Djehuty ritual in my Interview Day dua. 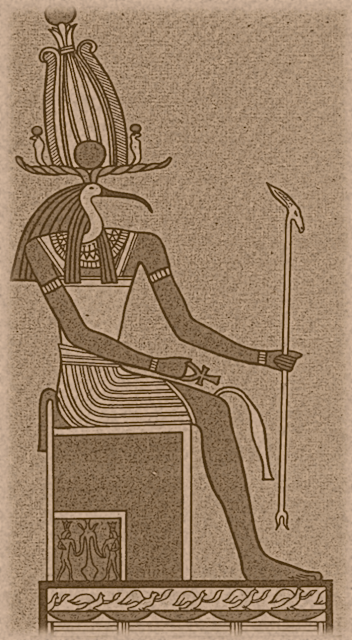 The source was Reidy’s Eternal Egypt, and the rite is full of powerful utterances: “Hail to you , Djehuty, Lord of Terror, strong of arm, who bathes in the blood of the enemies of the god, come to me when I call and be a shield round about me, defending me from every assault. Grant that no evil being, male or female, can enter into my house.” Wonderful, but it doesn’t actually make him less forbidding, does it? I think I’ve finally turned a corner with Dhehuty, and have gotten past the “Lord of Wisdom” aspects. Then there’s the distant Goddess story. After being tricked into not destroying humanity Het-hert/Sekhmet took off for the desert to be alone and kill things. Kemet became a sad, boring, barren place. Djehuty’s the one who searches her out and talks to her, (and Sekhmet in a killing mood isn’t the safest Goddess to be around!) tells her stories, flatters her, and persuades her to return. He also put himself in the middle of several epic battles including the Contendings of Horus and Set. He’s always the one who sticks his beak into negative situations, sometimes at great personal risk, to fix things. The other interesting thing I’ve run into is that he is sometimes described as the Son of Set and Heru. ( !!!!!!! ) Never mind that he made Set’s and Ausir’s birth possible, and Heru is Ausir’s son! If you can’t stand the polyvalent heat, stay out of the Kemetic kitchen, eh? Two male parents, but if Atum can create things all by himself by spitting, sneezing, and ejaculating, then why not? That brings a whole new dimension to the conflict between Set and Heru, doesn’t it? That would make Djehuty the male equivalent of Ma’at. 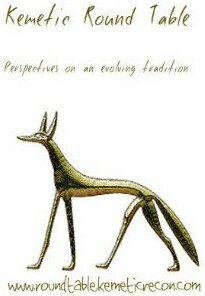 While Ma’at is the center of the balance, Djehuty is the balance of the two extremes. Wow. Ma’at is listed as his consort as well. Thinking about the meddling and bringing balance made all the difference for me. I think the wisdom and Heka just flows out of that, naturally. who is established on the Great Seat in the Mansion of the Moon! I embrace the earth before you as before the Bull of Ma’at. His arm is more powerful than the Netjeru. The spells of this great god are my spells, and my spells are his spells. I am pure, I am pure, I am pure, I am pure! — from Eternal Egypt by Richard Reidy. Of course, I might be a Bes kid instead. You never know. This entry was posted in Gods & Goddesses, Spiritualty, Theology and tagged Djehuty, Eternal Egypt, Heru Behdety, Hethert, Khonsu, Ma'at, Reidy, Sekhmet by helmsin2. Bookmark the permalink.